Malbec is a deep dark purple colored grape that originated in the southwest of France and is one of 5 varietals used in Bordeaux blends.As a varietal, Malbec has generally not done well growing in French climate and has been susceptible to rot and pests. In France, 100% Malbec is only made in Cahors. World Malbec Day (which began in 2010) is celebrated on April 17 because on that day in 1853 a bill was submitted to the Provincial Legislature in Argentina for the foundation of a Quinta Normal and a School of Agriculture which was the foundation for the expansion of Malbec in Argentina and helped contribute to Argentina’s dominance in the production of Malbec. Malbec is considered the national grape of Argentina but it is also grown in France, the United States, South Africa, New Zealand, Australia and Chile. The climate and altitude in Argentina allow Malbec to thrive and the winemakers of Argentina are combining the knowledge of the Old World with the innovation of the New World to make amazing wines. Malbec goes great with food and has an amazing price to quality ratio. Malbec traditionally has medium acidity and tannins and rich bold flavors with some spice. It’s a velvety texture, good mouth feel and value make it a popular varietal with consumers. 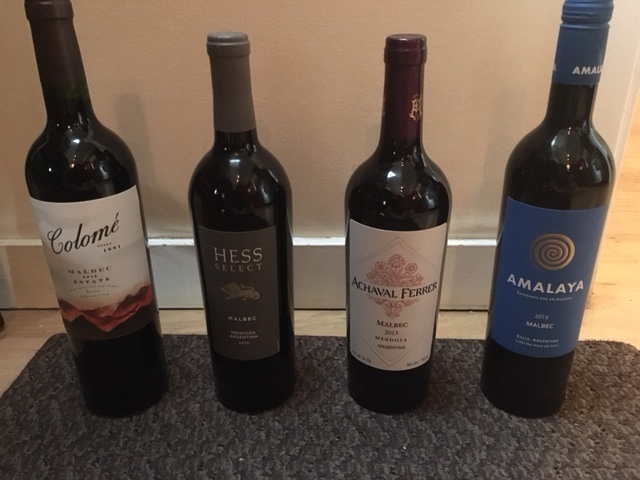 Below are some Malbecs I recommend you try for World Malbec Day, or any day! Happy World Malbec Day and as they say in Argentina, Salud y amor y tiempo para disfrutarlo! To health and love and time to enjoy them. Thank you to Hess Collection, Achaval Ferrer & Ordaz Family Wines for providing me samples of these delicious Malbecs. Think it’s time to start planning a trip to Argentina! This entry was posted on Sunday, April 16th, 2017 at 10:12 am	and is filed under Apellation, Food and Wine, Travel, Uncategorized, varietals. You can follow any responses to this entry through the RSS 2.0 feed. You can skip to the end and leave a response. Pinging is currently not allowed.